Gene therapy is a promising field of medicine in which normal genes or other genetic material are introduced into specific cells in the body to treat, and potentially cure, genetic diseases (ie diseases caused by defective genes in the body). A large number of patients and diseases that previously were not treatable by gene therapy, due to the lack of effective vectors, may now be treatable by 4DMT products. Our products are designed to unlock the full potential of gene therapy for rare and major market diseases. Humans are afflicted by thousands of inherited genetic diseases, and most of these affect children. The vast majority of genetic diseases do not have safe and effective treatments available. Hundreds of thousands of people, mainly children, suffer greatly; their disease symptoms are determined by which of the body’s ~25,000 genes is defective. Some children lose their sight, others bleed frequently, and others lose the ability to simply walk or breath normally. Some of these patients tragically die at a young age. In a few diseases, children can be injected frequently (every week or two) with replacement proteins that can partially stem the tide; nevertheless, the disease progresses steadily and the child’s quality of life is progressively degraded. We need effective therapies for these kids. We need cures for these kids. This is what 4DMT fights for every day. ARE DEFECTIVE IN A GENETIC DISEASE? number of proteins. Each gene is important for a normal life. subset required for its specialized function in the body. These genes are the cells’ “software”, coding for how each cell should function through the action of proteins. The proteins that genes encode for are the “hardware” that carry out almost every function in the body, from structures (eg bone, cartilage) to enzymes (eg that digest food) to messengers (eg hormones). When a gene is defective, either missing or “mutated”, the result is that the corresponding normal functional protein will not be present in the cells where it should be. Since a normal functional protein is missing, or at an insufficient level, the affected person suffers. If the gene for vision is defective, the person lacks a normal gene in their retina (tissue at the back of the eye) and they will develop progressive blindness (eg choroideremia, retinitis pigmentosa and others). If the gene for a muscle factor is defective, the person lacks a normal muscle strength protein and they will have problems with muscle wasting and even with normal activities (eg muscular dystrophy or lysosomal storage diseases). If the gene for a specific lung factor is defective, the person lacks a normal lung maintenance protein and they will have problems with breathing and lung infections (eg cystic fibrosis). WHAT IS THE GOOD NEWS? WE ARE WORKING ON CURES. There is good news and reason for hope. THE HUMAN GENOME REVOLUTION First, we are in the midst of an unprecedented revolution in our understanding of human genes. The entire human genome (all genes in our DNA) has now been sequenced. The time and cost of sequencing a person’s genes (their DNA) has dropped dramatically in just the last decade. These technological advances will continue to accelerate our understanding of genes and genetic diseases. 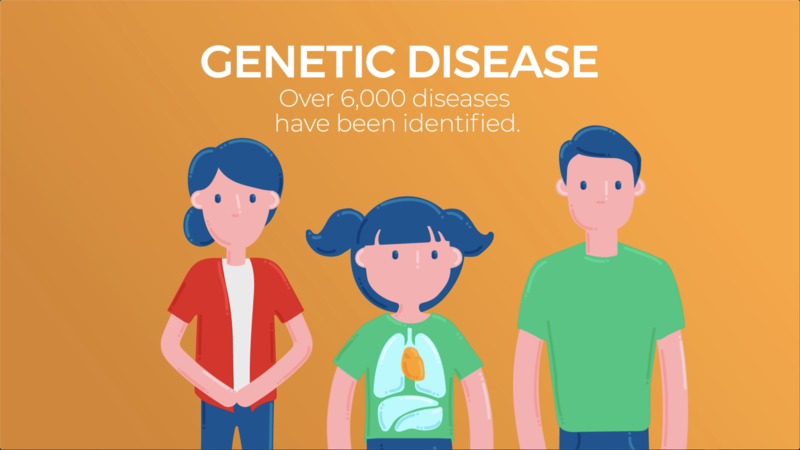 Every person with a genetic disease will have the opportunity to have his or her genes sequenced to identify the defective gene causing disease. THE GENETIC ENGINEERING REVOLUTION Scientists and doctors in the gene therapy community have discovered and perfected methods to insert a gene into a delivery vehicle (vector) and to have it activated in the right cells in the body. We can cure almost any genetic defect now in a petri dish of cells in the lab. If we could do the same in the human body we could cure many people with genetic diseases. 4DMT IS WORKING ON DELIVERING THE FINAL PIECE OF THE PUZZLE FOR CURES Given medicine’s understanding of genetic diseases, and our gene therapy technology, when will cures become a reality? Simply put, once we have highly efficient and customized delivery vehicles (vectors) to deliver the normal genes to the diseased cells in the body, we can turn the hope for cures into a reality. This is the problem that 4DMT is working to solve every day. We are working to create new customized delivery vehicles (vectors) to shuttle genes into the right cells in the body for each disease. This 4DMT proprietary portfolio of vectors includes vectors for the retina (in the back of the eye), for the heart, for muscles, for the lung and many other organs (brain, liver, joints and others). 4DMT and our partners will be able to hand pick a “4D designer vector” for any patient based on the organ (a collection of cells that has a function) that is diseased. These 4DMT vectors are designed to be markedly superior to the current 1st and 2nd generation vectors (see Therapeutic Vector Evolution). We are working to create industry-leading “gold standard” delivery vectors and gene therapy products every single day.